Google is always trying to make things easier for their users. The newest way Google will be making things easier is when it comes to exploring the world around you. This week, Google will be adding an "Explore" button to Google Maps for Android and iOS versions of the app. Currently, Google has an explore section after you open the search within the app. Explore shows you food and drink places as well as places to play, shop and sleep. All of these places are "nearby" meaning some are in walking distance and others will need a different form of transportation. All of the results show ratings made by other Google users, as well distance and price ranges in the form of dollar signs. However, the "Explore" feature is getting revamped with some new features and more information to help you explore what's new and hot around you. One of the first changes is that to access "Explore", Google will be adding a button in the bottom right hand corner of Maps. The only stipulation here is that "Explore" will only be accessed when you're in an area that the feature is available. The rest of the features revolve around what time of day it is, and where you are. While currently, Maps gives you a range of places that you can filter through distance, price, or ratings, the new "Explore" will allow you to preset the distance from where you are currently. 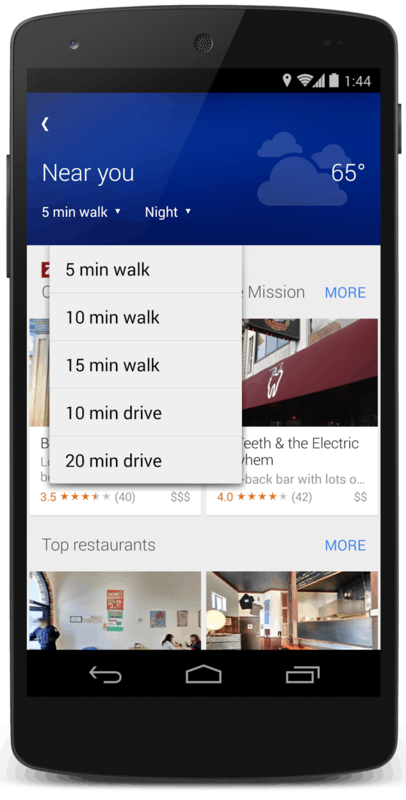 "You can decide if 'nearby' means a five-minute walk or a 20-minute drive." Another improvement is that "Explore" will know what time of day, or even what the weather is like to give you even more proper suggestions. Say it's a sunny morning, "Explore" will show you places to go for a nice cup of coffee or breakfast. Then, since it's sunny, maybe you want to take that cup of coffee over to a park to enjoy the weather, "Explore" will show you parks nearby. Planning a vacation? Google's thought of that as well. Simply go to the location of your vacation in your maps, and hit explore. Google Maps will show you what's nearby in that area to help you plan your vacation days before. Once you're at the location you selected, you can get even more information in regards to that place. Reviews and pricing will be available, as well as transit times from that place to where ever you want to explore next. Though for all of this to work, you'll need a few settings. Google asks that you have location reporting and history turned on in order to get the best use of this feature. One of the reasons for this is because you can save a place that you liked, and have better search results next time. Google hasn't said anything about if this feature just needs to be added server-side or by an app update.